Hope your Holiday Season is filled with MISCHIEF and FUN... ENJOY! Oh my word.. Adorable...I love those photos of the cats in the tree. They make lovely ornaments. lol How do you keep them from breaking things?? Looks lovely. The lights on your tree turned out well in the shots too. Im having trouble with that. You've been a very busy lady. And, everything looks festive - and gorgeous. Charming, Fifi!! And what a playground for your kitties :)... Merry, merry! Everything is gorgeous! I know that you have been busy. So lovely....just like your illustrations! BEAUTIFUL, Fifi! Love the furry ornaments! That is way too cute! and they are adorable! Your house looks beautiful, Fifi! Love the cats in the trees! It's so gorgrous, I love your Christmas decoration. Your decorations are gorgeous! You have been one busy lady! Absolutely gorgeous and stunning! Love it at night all lit up! Very festive! I lost count of the trees! I love your decor!! LOVE!! And you know those kitties steal my heart. Ugh I want one so bad!! 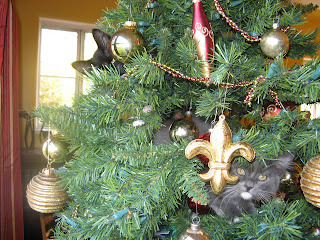 That's some serious decorating, Fifi, but the kitties in the tree are my fav; I hope to keep the pup girls out of the tree and out of the water this year; last year Honey ate through all of the light cords and I had to start over. Everything looks toasty and perfect, wishing you a wonderful Christmas season! oh i love your blog! I am your newest follower :) I am a kitty lover so of course this post was just adorable! Ive never had any of my cats climb our trees and now they are WAY too big for that, so they sleep under them! Thanks for joining Daphne and me for the link up. We hope you'll join us every week! Your home is lovely and your staircase...drool-worthy! Have a great Tuesday! On and I'm a new follower! so much fun! SO much bling! Happy Christmas! Ha ha! Those kitties made me laugh. 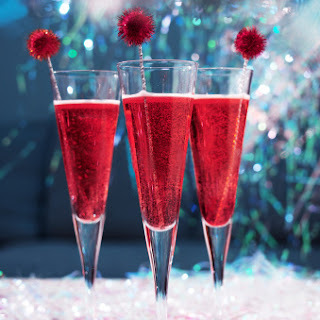 I love Love looking at Holiday Decor! Yours is very Festive and colorful! I love the tree and all the details! Great Blog! and btw Great ART!!! I found out about it through the giveaway! Wow, you have about as many trees as we do at Buttermilk Cottage. Yours are beautiful. CATS and CHRISTMAS...they just go togather. Looks lovely Fifi, just as we knew it would! Wonderful Fifi and I am sure Maman approves and your babies are happy! Gorgeous! I especially adore the kitties! Hi, Fifi, your trees are just beautiful! It all looks so festive & pretty at your house. Thanks for linking up! Oh Miss Fifiness.......you have been so busy and all is beautiful. 4 trees, you are an ambitious soul. Love the kitties. i'm cracking up at the kitties in the tree! 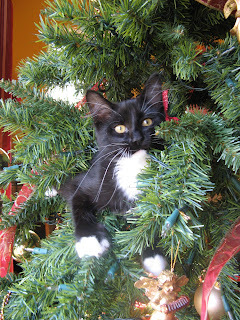 we have 2 cats and they LOVE to cause trouble in our tree every year :) xoxo!